I believe that the cross-pollinating spirit of SF can be authentically transferred to the writing of poetry, against the dominant ideology which views poetry as emanating from the individual, as being identified with the interiority of a "self." Even though poets group themselves into school and movements, they rarely allow active intervention by other hands at the point of creation...Bob and I seem to operate by recoding rather than rewriting: strands of text are interwoven, arranged in a different order, attached at the appropriate receptor sites. Discontinuities are preserved, rather than effaced as in a fiction-writing collaboration. 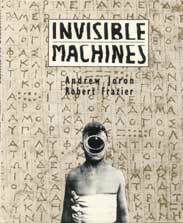 Reading Invisible Machines is like recalling images through a veil of amnesia. Suddenly seeing a thing of color, of pain, of strangeness, then knowing it to be your own. A mordant book. Recommended! Robert Frazier considered himself a science poet for many years, but after his collections Perception Barriers (Berkeley Poets, 1987) and Co-orbital Moons (Ocean View Books, 1988), he returned to more arcane work. His work has seen publication in major science fiction magazines and many book anthologies. He is twice winner of the Rhysling Award for Best SF Poem of the Year. Andrew Joron is the author of Force Fields (Starmont, 1987) and Science Fiction (Pantograph, 1992), as well as editor of Velocities: A Magazine of Speculative Poetry. His poetry and essays on poetry have appeared in Asimov's Science Fiction Magazine, Amazing Stories, Caliban, Synergy, New Worlds, Foundation and Exquisite Corpse. He is a three-time winner of the Rhysling Award. Thomas Wiloch's prose poem collections are: Stigmata Junction, Paper Mask, The Mannikin Cypher, Tales of Lord Shantih, and the Wordcraft of Oregon Mr. Templeton's Toyshop.